This new series seeks to define, advance understanding, and establish itself as a reference point in the study of an emerging field located at the interface between different disciplines: citizen media. The notion of citizenship has long been central to the study of how non-affiliated individuals, members of activist and fandom communities, and participants in social movements voice their views, articulate their shared interests and negotiate their personal and collective identities in public. Crucial to the exercise of citizenship is the mobilization of various means and practices of representation and expression in a range of media environments. Against this backdrop, a rigorous definition of the term citizen media is now being elaborated to designate the physical artefacts, digital content, performative interventions and discursive formations of affective sociality that ordinary citizens produce as they participate in public life to effect aesthetic or socio-political change (Baker and Blaagaard 2016). The new series sets out to make a major contribution to charting and expanding the territory of this evolving area of study and practice. Read more about the remit and key themes for this series here. 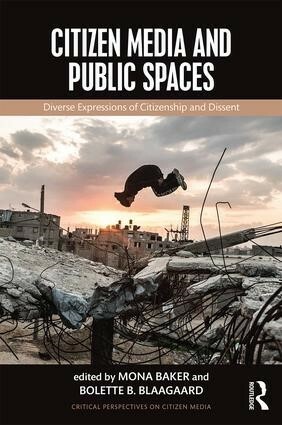 Research titles that advance (interdisciplinary) understanding of the various means and practices of citizenship representation and expression in a range of media environments; both monographs and edited collections (conference proceedings are not considered for publication as part of this series). Student orientated titles, either textbooks or other single authored or edited books aimed at undergraduate or postgraduate courses. Titles will fall under the umbrella of citizen media as outlined above, for which there is a viable or emerging market. Research monographs will be published in hardback in the first instance. We will endeavour to make monographs available in paperback and e-book formats after 12-18 months, at a price range that ensures the books are accessible to students and to members of the general public. Monographs and edited collections will vary in length between 60,000 and 80,000 words. The wordcount and scope of other output types will be negotiated on a case-by-case basis. The series publications will be promoted both through Routledge’s portal and a dedicated website to be launched at the end of 2015. These websites will be excellent resources to support the series, and will serve as repositories of digital content – whether they are meant to complement printed publications (e.g. sets of activities to be used in combination with textbooks, or audiovisual data sets associated with monographs) or constitute self-standing outputs. global distribution and marketing, with its strong presence and knowledge of the market in the US and UK and its dedicated international sales team. quality design and production values: Routledge’s books are produced efficiently, quickly and attractively. This is an interdisciplinary series that is designed to appeal to a wide range of scholars and postgraduate students in the following disciplinary areas: communication studies, cultural studies, film studies, journalism, multimodality, politics, social movement studies, sociology, translation studies, etc. The series will also endeavour to reach a wider public, including policy makers, activist and citizen media networks and groupings, NGOs and humanitarian organizations. The proposal you submit to the series editors will be the basis upon which the book’s suitability for publication will be judged. The proposal will be sent out for review by specialists in your field, so it needs to be organized in such a way that the reviewer is provided with sufficient and relevant information to gauge the quality of your work. The proposal will be assessed by the publisher and the series editors, who may request modifications. Provide a working title and a concise (approx. 300-word) and compelling abstract for your publication project. Outline the rationale for your volume. Identify the main themes and objectives that you aim to explore and achieve, respectively. Explain what you will be doing differently, in a more innovative way, or better than existing publications. Provide an outline of chapters, listing working chapter headings, and include a synopsis of what you intend to cover in each chapter. Where appropriate, a glossary of key terms should be included at the end of the volume. Similarly, all volumes should include a short functional index in order to facilitate quick reference. N.B. Compiling the index will be the author’s responsibility. State how many tables, accompanying material, diagrams or illustrations you are planning to include (roughly). Explain whether there are any copyright issues associated with the use of these materials. Justify the proposed wordcount for your book. Propose a realistic deadline for the delivery of your completed typescript. Discuss the intended audience for your book. Is it written primarily for scholars (if so, what disciplines), professionals (if so, which fields)? Provide details of relevant organizations and societies to which you think this book would appeal most. In the case of textbooks, identify the level of students you are aiming at. Would it be a core or a supplementary text providing secondary reading for undergraduate or postgraduate students? List any specific courses (including the level) for which this book would be relevant. Provide an overview of the main competing or related books, and explain how they differ from the one you are proposing. Will your project be focused on a particular geographical context? If so, you should provide evidence that your project will not be unduly constrained by that focus. Ideally, all proposals revolving around specific geographical areas or regional disciplinary discourses should aim to engage with global developments and debates. Please provide a brief biography of the (co)-authors within the proposal, as well as a separate CV. You are welcome to provide one or two sample chapters (preferably the introduction and another chapter), or draft manuscript, if available. List three to five people who would make qualified reviewers for the manuscript (preferably individuals whom you do not know personally), including the relevant affiliations. How will you ensure the collection is of a consistent academic quality? Are the chapters structured logically and integrated around a coherent central theme? Will you be providing a detailed introductory chapter and a conclusion? Is there meant to be a combination of conceptual and analytical chapters? What percentage of the material has been published before, if any? Include a short biography (including current institution, departmental affiliation, and recent publications) for each contributor. Also note which contributors have made a commitment to the project and/or completed their contribution. Describe any pedagogical features that you plan to include (i.e. discussion questions, activities, glossary, case studies, vignettes). Describe any supplements that you would like to include (i.e. companion website, instructor’s manual). A course book should be written with the needs of an instructor in mind. Please list five or more challenges faced by instructors teaching your subject matter and then identify the specific ways your book will help instructors grapple with these challenges. Compare your book to its top competitors, including detailed information on each of them (author, publisher, publication date, price, page count, distinctive elements, strengths and weaknesses). Is there a viable market for your proposed text book? N.B. All authors will need to comply with Routledge’s General Style Guide– to be provided upon signing the contract.